Well, this year  the tribute ship (kaisen) betook to Satsuma in order to carry out Ryūkyū’s annul tribute payment to Satsuma, the preparations for next years tribute payment, as well as this and that. This is the reason why Shiohira sailed towards Satsuma. Before this, Shiohira often sailed to China in above mentioned position, too, where he visited Fujian 福建 several times and also went to Beijing 北京 two times. In the fifth year of the sexagenary cycle he also went to Edo in Japan with an Ōji (prince) as congratulatory envoy for the imperial proclamation of the new shōgun. In Fuzhou and Beijing, he also seems to have trained as a Ryūkyūan interpreter (tsūji 通事) and he had good knowledge of the Chinese language. This year he seems to be 53 years of age, but he looks much older than this. 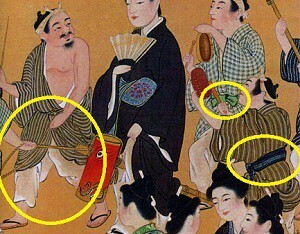 See the banana fibre top (bashofu 布芭蕉), the underpants (hakama 袴), and girdles wrapped around the waist twice and tied in the front. His clothes are made from banana fibre (bashofu 布芭蕉) and from cotton, which comes from the various islands [of Ryūkyū], and usually has wide sleeves. He wears trousers (or underpants) which are called hakama 袴. The girdles 帯 are made from patterned satin 綸子, silk gauze 紗, twill weave 綾 etc. They are wrapped around [the waist] twice and tied in the front. The collar is turned inside out (folded), and under the arms or at the sides of the back there are pleats (folds). People from the Ryūkyū main island [Okinawa] make these pleats (folds), but people from the other islands don’t. Well, they wear Ufu-ubi (large belts) at formal occasions. The clothes are similar to the ceremonial costume of Japan (kamishimo 上下着). Formal clothes are worn by the nobility at certain times when attending Court, during an audience with the King, an audience with the fedal lord of Satsuma, or when visiting the castle in Edo [i.e. visiting the shōgun]. The socks (tabi 足袋), straw sandals (zōri 草履), wooden sandals (pokuri 木履) and umbrellas 傘 are all made in the Japanese fashion. In good and bad weather Shiohira used a long-handled umbrella. There are some interesting points to note here. First of all, we were able to establish his year of birth. In the above translation we found out that Shiohira Pēchin was 53 years old at the time in 1762. Therefore, and according to old year count, he was born around 1710. In the future you can therefore write Shiohira Pēchin (1710 – ?). Next, Shiohira Pēchin is described to have went to Edo on official mission in the tsuchi no e tatsu 戊辰. That is, the fifth year of the sexagenary cycle. This can only refer to the year 1748. Such missions were called Edo-nobori, or “Going up to Edo.” According to the text, the occasion was the imperial proclamation of a new shōgun. From the given year we can determine that this was Tokugawa Ieshige 徳川家重 (1712–1761), who had assumed office three years earlier, in 1745. Furthermore, from other sources we can also determine the envoys. The mentioned Ōji (prince) who served as the Ryūkyūan congratulatory envoy was chief-envoy Gushikawa Ōji Chōri 具志川王子朝利. He was accompanied by vice-envoy Yonabaru Uēkata Ryōchō 与那原親方良暢. There is more and here it gets a little more complex. See the following three entries. Also in the year 1748, a certain Gisushi Satonushi Pēchin Seijō of the Ō-clan 翁氏宜壽次里之子親雲上盛成 served as shisan 使賛官 for Nakijin Ōji Chōchū 今歸仁王子朝忠, who went to Satsuma as a congratulatory envoy for the promotion of Shimazu Munenobu 島津宗信 (1728–1749) to Major General of the Left and Right Imperial Guard. (Cf. genealogy of Nakijin Ōji Chōchū 今歸仁王子朝忠 (向宣謨)). According to the Chūzan Seifu, in 1755 Gisushi Satonushi Pēchin Seijō 翁氏潮平親雲上盛成 of the Ō-clan was dispatched to report about the investiture mission (sappōshi 冊封使) from the Ming dynasty taking place in the summer of the following year. He arrived in Satsuma the following year on 1756-02-30, and returned home again on 04-11. Finally, for a tribute mission to China in 1757-58, Gisushi Satonushi Pēchin Seijō of the Ō-clan 翁氏潮平親雲上盛成 also appears as Kansha 官舎, or warehouse manager. Both in the genealogies as well as in the Chūzan Seifu, the person is described as Gisushi Satonushi Pechin Seijō of the Ō-clan 翁氏宜壽次里之子親雲上盛成. Now, instead of this Gisushi 宜壽次, the Ōshima Hikki writes Gisushi 宜壽須. Furthermore, the Ōshima Hikki also says that Shiohira Pēchin had been called Shiohira before he actually took the homonymous territory. Furthermore, the Ōshima Hikki also states that Gisushi Satonushi Pēchin 宜壽須里之子親雲上 was Shiohira’s younger brother. Therefore, the above entries 1. to 3. appear to refer to Shiohira’s younger brother Gisushi Satonushi Pēchin. However, both the Chūzan Seifu and the genealogies give Gisushi Satonushi Pēchin’s first name as Seijō 盛成, and this is noone else but Shiohira Pēchin (Ō Shiren 翁士璉) of the Ōshima Hikki. So, “Gisushi Satonushi Pēchin 宜壽次里之子親雲上” was an earlier official name of Shiohira Pēchin. 1748 – went to Edo with chief-envoy Gushikawa Ōji Chōri and vice-envoy Yonabaru Uēkata Ryōchō as a congratulatory mission to new shōgun Tokugawa Ieshige 徳川家重 (1712–1761). 1748 – went to Satsuma with congratulatory envoy Nakijin Ōji Chōchū for the promotion of Shimazu Munenobu (1728–1749) to Major General of the Left and Right Imperial Guard. 1757-58 – tribute mission to China in the function of a warehouse manager (as kansha 官舎). Prior to 1762 – often sailed to China where he visited Fujian 福建 several times and went to Beijing twice. Looking at the above results, it can be said that a more colorful picture of Shiohira Pēchin (1710 – ?) has now emerged. Acknowledgement: Many thanks to Motobu Naoki Sensei for his full and benevolent support in clariyfing various difficult issues, as well as general guidance on the translation of various terminology and contexts. This entry was posted in Ōshima Hikki, Unknown Ryukyu. Bookmark the permalink.